Robert Reynolds was the son of Thomas Reynolds, who came to Detroit as the Commissary Officer for the British Fort Lernault. Thomas’s children, Margaret and Thomas Augustus were born in Scotland, Ebenezer, Robert and Catherine were born in Detroit. In 1796 the family moved with the British Army to establish Fort Amherstburg, where Reynolds continued as the Commissary Officer. In 1803 Robert married Therese Bouchette Trottier dit Desrivieres, the widow of James McGill’s step-son. (James McGill of Montreal was the head of the North-West Fur Trading Company. Robert married into a fur trader’s fortune.) After his father’s death in 1811, Robert succeeded him in the Commissary Office. In 1812, Robert’s mother was one of the ten richest people in Amherstburg. In the Fall of 1813, Britain ordered an evacuation to a new headquarters at Burlington, due to American forces invading and occupying Amherstburg until July 1, 1815. Robert and his family returned to Amherstburg, a war torn and depressed area in 1815. Robert’s sisters, Margaret and Catherine were both trained artists. Margaret’s best known work is “Amherstburg, 1813”. Catherine produced a large body of work, including pastoral scenes of Palladian country homes, and is regarded as Canada’s first native born woman artist. Neither woman married and after the death of their mother they lived with their brother Robert and his family. In 1816, Robert began construction of a new home with a choice outlook across the river, which Therese named “Belle Vue”. This was the largest home in Upper Canada at the time. It was a significant piece of architecture, a neo- Palladian / neo-classic country house mirroring Palladian farm homes in England. Robert Reynolds died in 1865 and his son Dr. Robert Todd Reynolds took over the property. The property sold to William Johnston, a druggist, in 1871. Johnston updated and enlarged the house into a fine Italianate Villa.The “hyphens” were removed and replaced by large reception rooms, each with a bay window overlooking the river. The attic space was finished as rooms with hallways connecting the second floor from end to end. 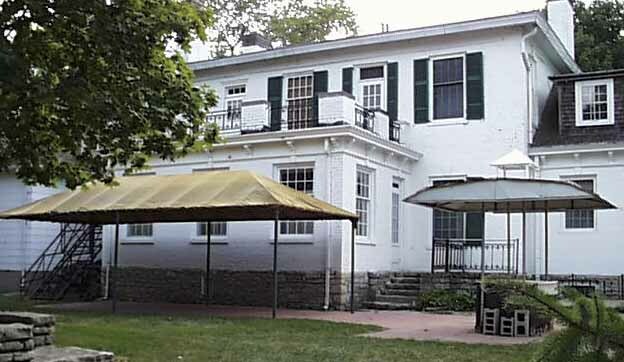 The classical front porch was removed and replaced with a verandah that stretched across the front of the main block. Windows were covered with louvered shutters. Inside, it appears that in place of the original straight stair a circular stair was installed The south reception room was one large drawing room with beautiful carved paneling, and surprisingly a decorative fireplace (no chimney). The basement was also connected from end to end under the new infill rooms. Perry Leighton was the next person to own Belle Vue. He was interested in Archaeology, and excavated many of the First Nation artifacts that are now displayed in Windsor’s Chimczuk museum. One of the rooms with the bay windows was used as his personal museum to display his collection. Perry Leighton owned the property until his death in 1905-6. 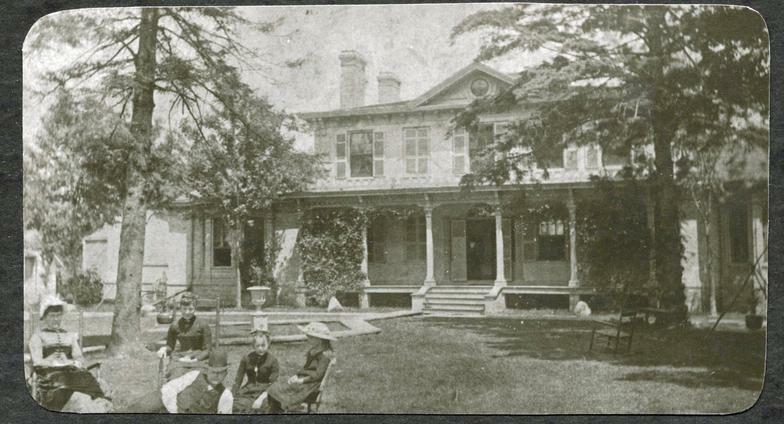 The property was sold in 1925 to John G. Mullen who served as Mayor of Amherstburg for three terms, and owned a large coal and shipping company. The New York architectural firm of Palmer and Riley updated the house in the then popular colonial revival style which restored the house to its original look. The family moved in after three years of renovations in 1927. The Italianate verandah was replaced by a neo-classic porch over the front door. A new large poured concrete and limestone porch with a room beneath was added across the front of the centre block. The back porch was rebuilt and enclosed with a full basement including vault and walkout to the rear garden. The basement was dug deeper, and cinder block walls constructed to create storage and furnace rooms with a huge coal room to feed the furnace. Mr. Mullen died soon after the house was completed, but his wife and children continued on at the house through to 1946 when the Mullen family sold the property to Veterans Affairs to be used as a retirement home for WWI Veterans The second floor became a series of numbered room with cupboards along the north hallway built for linens etc. Several bathrooms were made and finished with large glass tile on the walls. A sprinkler system was added throughout the building. An institutional kitchen was installed in the north dependency and the dining room was enlarged by removing the wall between the dining room and breakfast room. 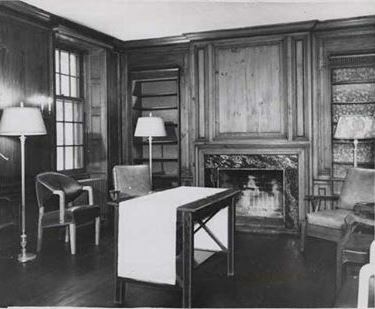 The south reception room was made into a lounge and the drawing room was furnished as a library. Local lore has it that the basement was unfinished but furnished with pool tables for the residents’ enjoyment. It should be noted that the building, by today’s standards, was not at all accessible. The stairs are steep and narrow and the floors on the second-floor change levels by a couple of steps as one proceeds along the hallway. In 1954 Veterans Affairs closed the Belle Vue Veterans Home and moved the residents to London. 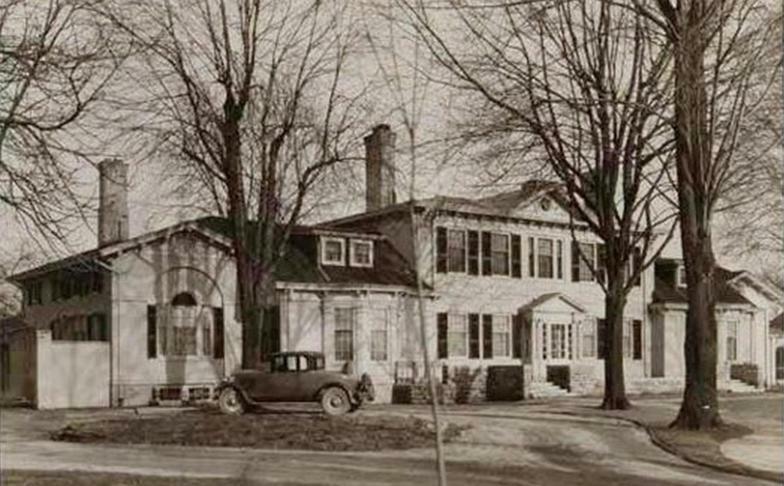 Mrs. Nellie Tetzlaff bought the property in August 1955 to operate as a nursing home, but due to illness, returned the property to Veterans Affairs. On June 3, 1962 St. Nicholas Ukrainian Catholic Church was officially opened, after acquiring a house that had been derelict and vandalized. Work was done to make repairs to the house and to landscape the grounds for picnics and weddings. The site was to be a church, a place for Priests to live and as a Ukrainian cultural centre. The carriage house was made over as a serving area for outdoor functions. The south reception room became the church sanctuary, an addition to the back created the chancel area and the pioneer kitchen became the vestry for the priests’ robes. The commercial kitchen served the dining room for banquets etc. The wall between the front hall and reception room was removed. Bathrooms were installed behind the circular staircase and in the north-east room of the centre block. The second floor was not put into use, although a room over the kitchen was used as a church office. 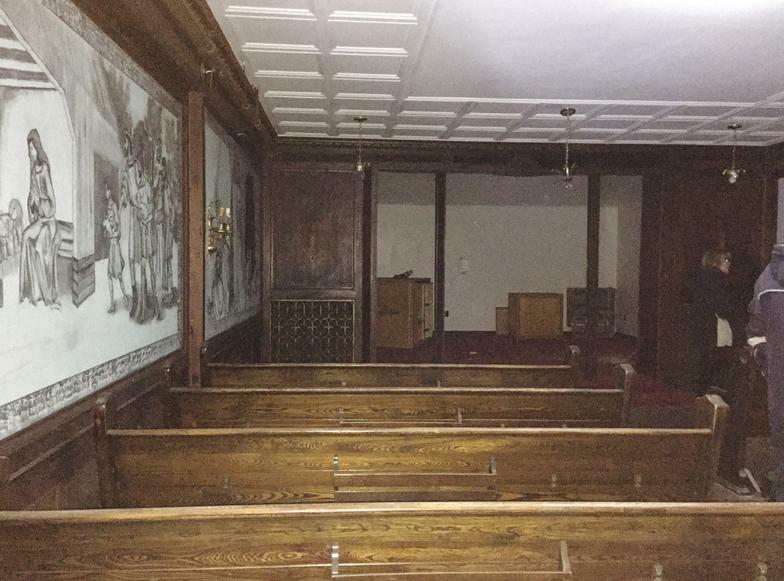 EugeneTaskey removed damaged paneling and replaced it mahogany panels that he painted with religious images. He did charcoal drawings, but was unable to complete them with colour, as he lived in Detroit and was refused entry at the border. Grants through Parks Canada were used to install a new copper roof over the centre block, and a wood shake roof on the rest of the building. An accessible ramp was added to the front porch, other repairs were made and a new federal plaque was installed in the gardens by the front porch. By the 1990’s the congregation was dwindling and maintaining the property was becoming difficult. In 2000 the diocese sold the property to a numbered company and the congregation was amalgamated with a church in Windsor. The only remnant of the church today is the cross at the waterfront and the Taskey drawings. The property was left to deteriorate. Heritage Canada designated Belle Vue as one of the top ten heritage structures in Canada in danger of demolition by neglect. Local interested citizens came together to form the Friends of Belle Vue and with continued lobbying the Town of Amherstburg finally stepped in to acquire the property for public benefit. The town took possession of Belle Vue National Historic Site Amherstburg on Nov, 14, 2016.